A backyard swing set can offer an excellent spot for your children to develop their strength, agility, and other motor skills all while getting in their recommended daily physical activity, but they aren’t without their risks. According to the Consumer Product Safety Commission (CPSC) about 51,000 children are treated in hospital as a result of injury sustained on at-home playground equipment. Most injuries are due to falls, and as a result, they recommend swing and play sets be set up over a protective surface. They also recommend spacing swings an acceptable distance apart, as well as properly maintaining your equipment. Teaching children to play safely will also help prevent serious injuries. We reviewed dozens of backyard swing sets to identify the best of the best. We looked at all types of swing sets to fit any yard, child and budget. We found simple swing sets and elaborate; those that you can set up in under an hour and some that will take all day (if you’re lucky)! There are wood, plastic, and metal swing sets on our list as well as a thorough list of the best accessories, so no matter what your need is, we have a swing set for you. For a quick assembly, safe design, and fun for years to come, look no further than the Lifetime Monkey Bar Adventure Swing Set. Early in our research we found the Lifetime Monkey Bar Adventure Swing Set and it stuck with us as an obvious choice for top pick. It includes swings, monkey bars, and even a slide; there’s a little bit of everything on this set. 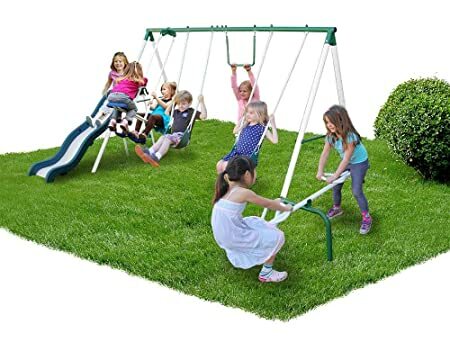 The Lifetime Monkey Bar Adventure Swing Set with 9 Foot Wavy Slide outdoor swing set comes complete with three swings, a trapeze bar combo, and wavy slide to provide kids with hours of outdoor play. The heavy duty steel alloy boasts a low-maintenance design that is crack-, chip-, fade-, rot-, and warp-resistant. All the hard edges are rounded to minimize injury to your little one and the corners are covered with plastic caps while the chains have rubber grips to prevent pinching. Assembly is required with this set, but the reviews are full of reports that suggest it’s neither complicated or time consuming. Set up with this set’s layout doesn’t require any cementing or digging; it won’t tip no matter how high your kid swings. That kind of time and sweat saver is the kind of big win for assembly and construction that we’re sure you’ll appreciate. As a rule, swing sets may not have loads of reviews on Amazon because people tend to purchase elsewhere (although that is certainly changing); and of the reviews swing sets do receive, they tend to be pretty critical. This swing set, however, is the exception. It has nearly 400 customer reviews and and overall rating of 4.7 stars – quite the impressive feat! The Gorilla Playsets Nantucket Swing Set will look amazing in your back yard while keeping your children happy for years to come. 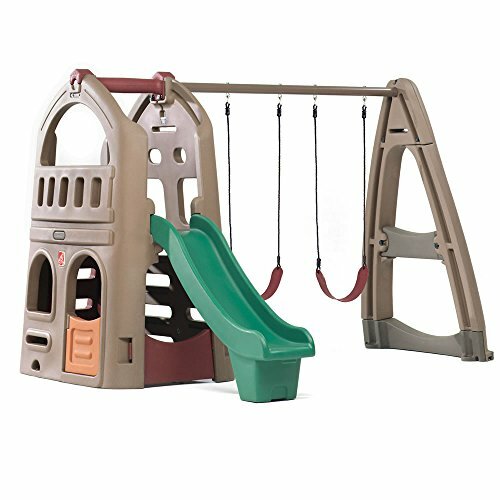 The Gorilla Playsets Nantucket Swing Set has virtually anything you could want in a swing set. 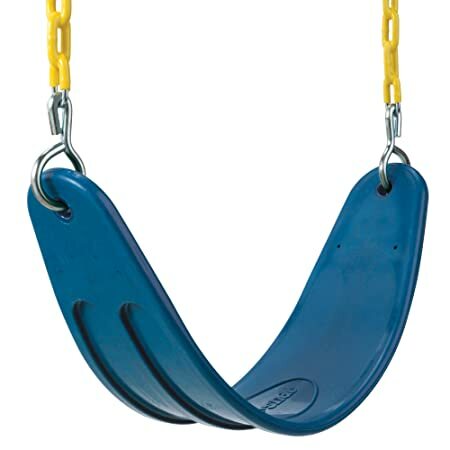 The two belt swings have a paint-covered chain that will will prevent pinching and injury while the swing set portion also includes a single, swinging monkey bar. 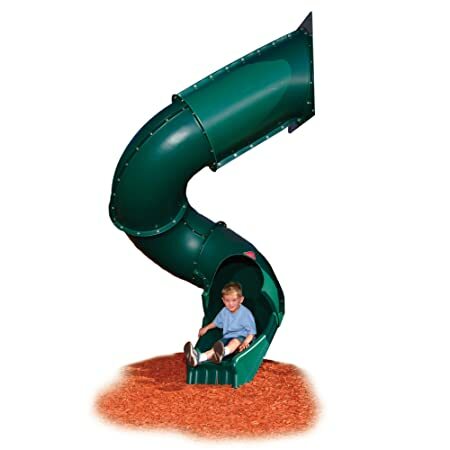 It also includes a wavy slide that travels from the 2-story play house to the ground. The play set is made with a durable wood and features sturdy accessories you won’t need to replace often, if at all. The rock-climbing wall includes a rope to assist in climbing and the other side has a more basic inclined ladder to give the set an easier path up for your smaller children, as well. There aren’t many reviews on Amazon, under 50, but the reviews that are included have given this set an overall rating of 4.6 stars, and for only $1,200 for all that you get, that’s plenty to tempt us! For a swing set that will give you everything your little one wants in a swing set without breaking your budget, look for a Step2 Naturally Playful Playhouse Climber & Swing Extension. 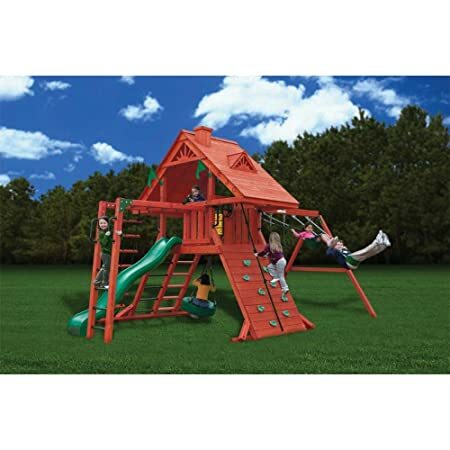 The Step2 Naturally Playful Playhouse Climber & Swing Extension outdoor play set comes complete with two swings, a slide, and lower level clubhouse. It boasts a durable and low-maintenance double-wall poly construction and was made in the USA for quality you can trust. The set is ideal for smaller children, but will age decently well as well. The clubhouse has enough cover with the slide and climbing ladder that your older kids will love the secrecy and all will enjoy the walk-through door creating a perfect set-up for a base or house pretend play. 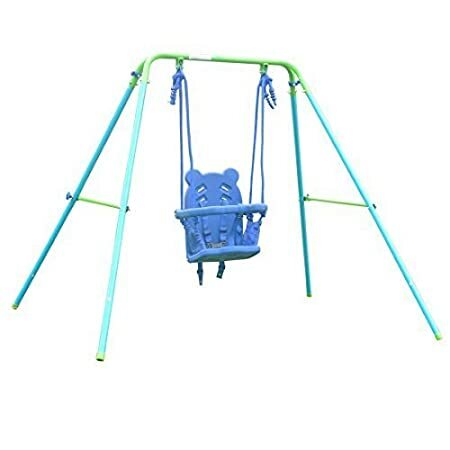 There are well over 100 customer reviews on this swing set earning it an overall rating of 4.2 stars so you can make this purchase with a reasonable expectation of your satisfaction. And were that not enough to sway you, this set is also under $600. You’ll be able to give your kids a wonderful set without setting your family back on financial goals. If you want a classy wood swing set that will keep your children entertained for years, pick up a Winchester Wood Complete Play Set. 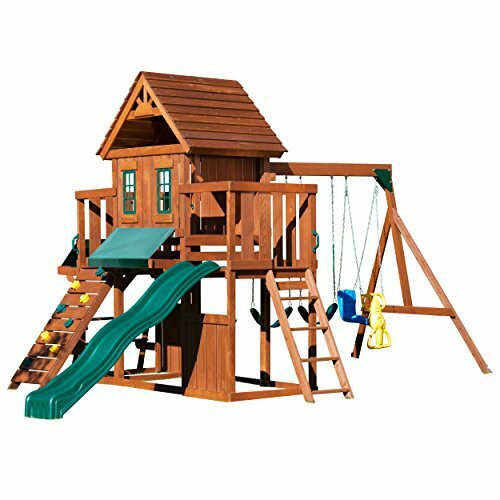 Complete with everything you need in the box, the Winchester Wood Complete Play Set features two swings, a glider, picnic table, slide, rock climbing wall, and three large play decks to provide hours of active outdoor entertainment. It can easily be set up in a day thanks to the pre-drilled lumber and easy-to-follow step-by-step instructions. The two half-picnic tables each have awnings to offer your little ones a bit of protection from the blistering sun and the second story can be reached by the rock-climbing wall or via the safer, and less intense, inclined ladder with a steel handle to assist and guide your kids up. 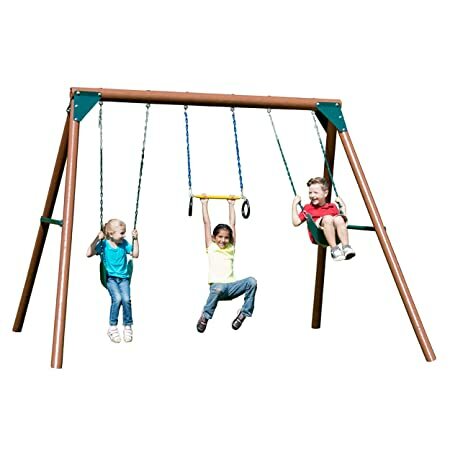 This swing set has nearly 400 customer reviews with an overall rating of 3.9 stars; and that isn’t bad at all. Especially considering how long you’re likely to have this set, there’s a lot to be said for this purchase. For a swing set that will give you the ease and durability of metal with several bonus safety features, check out the Lifetime Big Stuff Adventure Play Set. The Lifetime Big Stuff Adventure Play Set comes complete with two swings, a slide, trapeze bar, climbing wall, and more activities to keep busy in the fresh air. It boasts a durable design of high-density polyethylene and powder-coated steel for years of dependable weather-resistant use and comes with a five-year warranty. The edges and corners are protected with rounded corners and rubber or plastic protectors to keep your little one safe, even when he’s going full-on beast mode. Because of the design layout, there is no cement or digging necessary; it’s free-standing to make that a complicated step you won’t need to even worry about. This play set has over 150 customer reviews on Amazon and an overall rating of 4.5 stars – which is certainly nothing at which to scoff. It’s fair for you to expect satisfaction after purchasing this set. A backyard swing set may sound pretty self-explanatory but you’ll want to remember that a swing set that goes in your yard will be very different than the swing set in your neighborhood park. For one, the park’s swing sets need to be incredibly durable because the expectation is that it will need to take a beating from thousands of children in its life. Yours will likely only have a few kids for just a handful of years as they age out of that kind of play. However, that means you’ll be able to get more adventurous accessories and more aesthetically pleasing designs. A wood play set in a park will be torn up in a matter of just a couple years, but will likely last your family the entirety of your kids’ playing years. Likewise, a metal set may pose too great a risk, with its hard frame, but your children won’t be overcrowded while they play, running less of a risk of injury. So even if a park is right across the street, there are still plenty of reasons for you to get your children a personal swing set. For a quick assembly, safe design and fun for years to come, look no further than the Lifetime Monkey Bar Adventure Swing Set. Ease of setup. Chances are, you aren’t a professional “Swing set setter-upper” but you probably think you can set your new swing set up on your own without a problem. Or, like so many others, you picked a swing set that you know your children will like and as soon as you put your credit card back in your wallet after buying, you then consider how difficult it will be to assemble. You will definitely benefit from the estimated time for assembly listed on most swing sets. The truth is, though, set-up will very likely take you longer; in some cases much, much longer. If it cites 12 hours for assembly, keep in mind you don’t usually have 12 hours to devote to solely this project like it is projecting with that time estimation. Getting tools out, putting them away, and overall prep and clean-up will add to this time and you may find you actually end up spending days or weeks finishing set-up. And when the instructions suggests two to four people, it means it. So do yourself a favor and come up with a plan beforehand. Some sets offer expert assembly for an extra charge. Wood. Wood is a softer material than steel but it will hold up to your children’s abuse and weather just fine. If properly treated, it will last for years without any rot and even if it does, that piece may be easily replaced. It’s also a design that is natural enough that you won’t need to worry about it’s overall impact on the world. You can dispose of it much easier than other materials, so you won’t need to worry about what happens after your children outgrow it. What appeals to most people though, is the appearance. Wood play sets can look much like your own home. You can even paint them the same color to make it match. Metal. Metal has a reputation for rust, and while that is still a risk with most, if not all, sets, advancements in coatings and protectors mean it isn’t the risk it once was. Metal sets are typically easier to set up than wood with a much lighter overall weight. And while heat can make a metal set hot to the touch, it won’t burn, melt, or warp with extreme weather like other materials. Plastic. Plastic may not be the material that makes for a lifelong swing set, but it will be the kind that will stand up to your children’s rough play. The edges are smooth and safe while the construction is very often suited for even your younger, clumsier toddlers. It’s also going to be an easy assembly, lightweight and – big bonus: it’s usually the least expensive option. Accessories. You can really spruce up a basic set with a few accessories that change the range of your children’s pretend play. And doing so can save you a bit of money, both in the long-run and overall. You may get more for your money if you opt for an all-encompassing kit, but you’re going to get a lot of accessories you don’t need or even want. By purchasing a basic set and only adding on the accessories you want, you’ll be able to customize your set just as you like it. You can always also purchase those elaborate kits and make them even more elaborate by adding in tic-tac-toe boards or telescopes or whatever you see fit. Accessories are the biggest opportunity to really “bling out” for your swing sets. Upgrades. To go hand-in-hand with the accessories you can purchase, keep in mind that the ability to add on to a swing set usually exists. You can do the basic changes as a child grows; from baby swing to belt swings. But even more, you can upgrade an inclined ladder to a rock wall or, if you find a swing set that’s compatible, you can later add on an entire 2-story play house/fort to a more basic swing set to make the swing set a bigger pull for your children. How much is a swing set? For a basic metal swing set, you can expect to spend anywhere from $100-$500. Wood swing sets will cost you a bit more, typically ranging from $500-$1,200 for a simple swing set. The more elaborate set up you choose to go with for your swing set, the more you’re going to spend on it. You can very well spend up to $10,000 on a more extravagant swing set; particularly those with add-ons and bells and whistles. As you can probably guess, the more you spend the more you get, both in quality and quantity. If you want to have your elaborate swing set in the $3k range installed by professionals, you can expect to spend around $500. While you may not be interested in that extra expense, consider that a professional will be able to accomplish in just a day or two what may very well take you weeks or months. 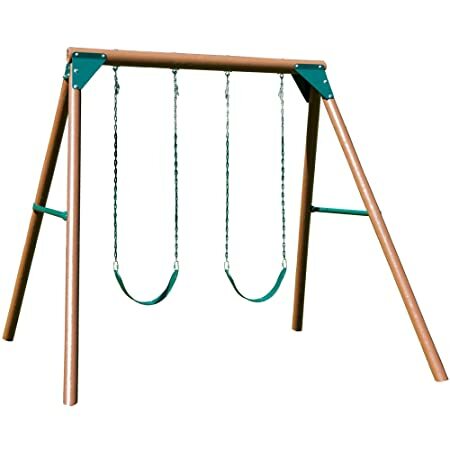 What is the best material to put under a swing set? The absolute best material to put under your swing set may not be the most feasible. Rubber tiles or poured rubber is probably the safest option available to you; it is porous and will drain well, has a soft and bouncing surface to catch falls, and it incredibly low-maintenance. But it’s also the most costly. Rubber mulch will offer a lot of the same benefits but will be easily spread and can prove a chocking hazard, as well. The maintenance is much higher and you’ll need to replace the mulch every few years. Sand is another viable option that is cheaper still, but it spreads easily and not only presents a choking hazard but also a risk for eyes. Not to mention that wet sand is not nearly as soft as dry, so the landing can be much more painful for your little one. Wood mulch is probably the most affordable option that is still safe, but it definitely has its own negatives – particularly that it’s not a permanent fix by any means. You’ll often need to add more mulch to the playground and you should expect your children to track it in; as well as possible splinters. How far should a swing set be from a fence? You’ll want a good flat space for your swing set that will help your little one avoid trips and slips, of course, but you’ll also need that space to be free of any debris or barriers. You’ll want a minimum of an eight foot clearance around all parts of a swing set. For the space surrounding the swings themselves, though, you need a minimum of a ten foot clearance. Not only will you need the space for your little one to swing, but you’ll need to keep in mind that your children will very likely be running all around this play set in excitement. Trips and jumps and falls are not only likely but imminent; you should avoid the risks you can by keeping the clearances at at least minimum recommended distances. Speaking of safety, be sure to check out our Parent’s Guide to Child Safety for tips on keeping your kids safe at home. While thinking of spacing, we’d be remiss if we didn’t remind you that toddler swings should be at least twenty-four inches off the ground – or however high they need to be to ensure your little one isn’t pushing himself with his legs. How deep should mulch be on a playground? The depth required for your mulch will depend on the composition of the mulch. You can probably get away with a less deep rubber mulch than a wood one. There also some discrepancies on the standards for mulch depth on playground mulch. The American Society for Testing and Materials requires between three to six inches deep at a minimum while the National Safety Council recommends a twelve-inch depth. There is no law regarding what depth you should put the mulch in your yard, however, so you’ need to use your discretion and make a command decision for depth. We highly recommend at least a three inch depth to help prevent injury, though. We looked at 45 other backyard swing sets. Even though they didn’t make our 5 best backyard swing sets list, they’re the best of the rest and each is still a great option for your home. The information you’ll need to compare each one is included with the listing. 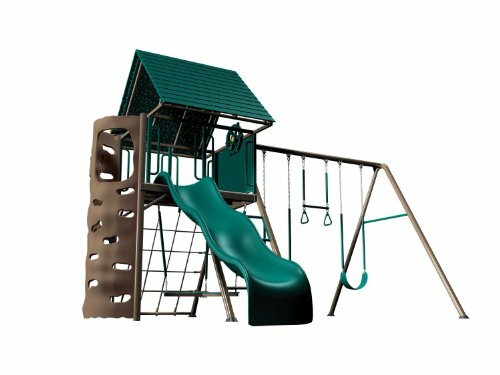 This outdoor play set comes complete with a wavy slide, two swings, a rock climbing wall and glider to inspire and delight little minds. It boasts a durable cedar wood construction to provide years of reliable use in all sorts of weather conditions. 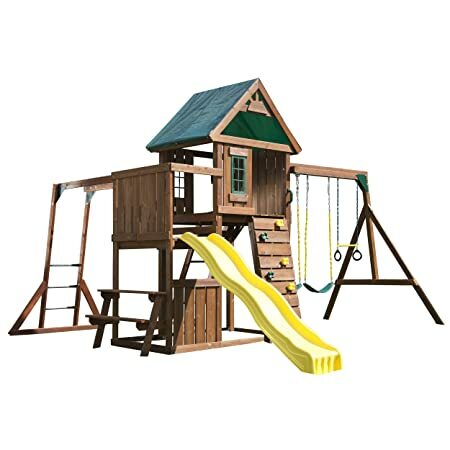 This outdoor play set comes complete with a wavy slide, two swings, a rock climbing wall, lookout tower, monkey bars, and glider to inspire and delight little minds. It boasts a durable cedar wood construction to provide years of reliable use in all sorts of weather. 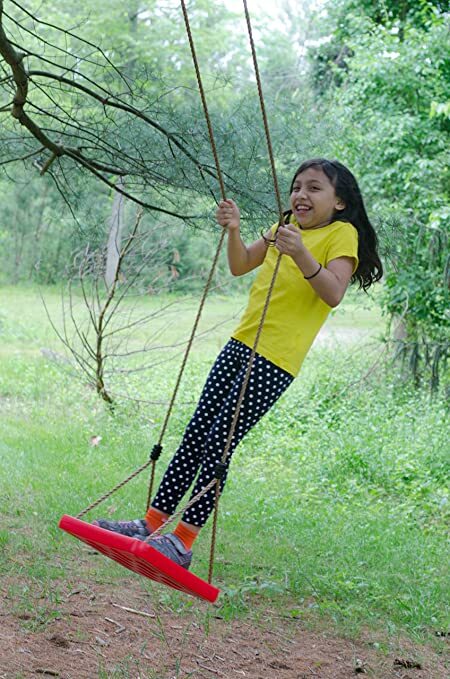 Give your child hours of healthy active outdoor play with this wooden swing set that comes complete with two swings, a trapeze, slide and rock climbing wall. The play deck above gives your child a bird’s eye view of the action and the integrated picnic table provides a quiet spot to take a rest. 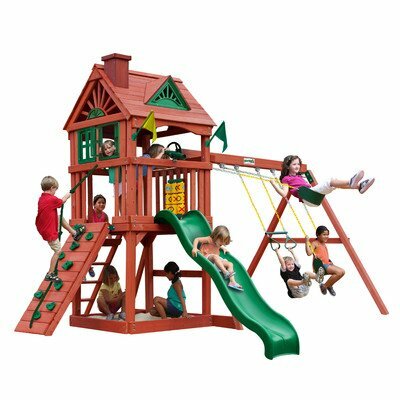 Ideal for a big backyard, this outdoor play set comes complete with one slide, four swings, an indoor clubhouse, ladders, and a monkey bar playset. It boasts a durable cedar wood construction to provide years of reliable use in all sorts of weather. This backyard play set comes complete with two swings, trapeze bar combo, slide, and climbing wall. It boasts a durable yellow pine construction, and has been made in the USA for quality you can trust. This simple backyard swing set provides everything your child needs to enjoy the wind in their face. It comes complete with two swings and boasts a durable, maintenance-free wood construction for years of dependable outdoor use. Installation hardware, including ground anchors, is included. This backyard play set is an outdoor adventurer’s dream thanks to two swings, trapeze bar, rock climbing wall, tire swing, wavy slide, and monkey bars. It’s sure to provide the kids in your life with hours of healthy outdoor play. This backyard play set comes complete with two swings, a glider, rock wall, slide, and built-in picnic table. It boasts two storeys of play space for children to flex their imagination muscles. 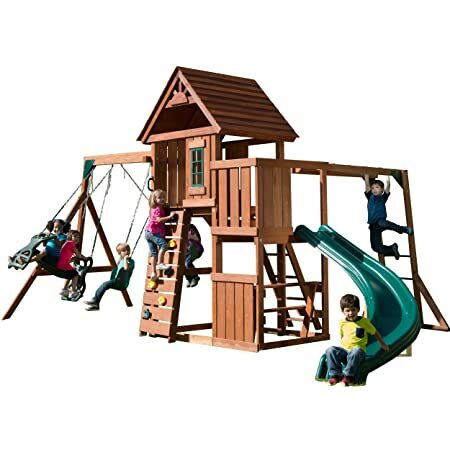 This wooden outdoor play set comes complete with swings, slide, rock climbing wall, glider, and monkey bars to provide the complete outdoor play space for your little ones. All lumber had been pre-cut and pre-drilled for easy installation, and includes fully illustrated instructions. 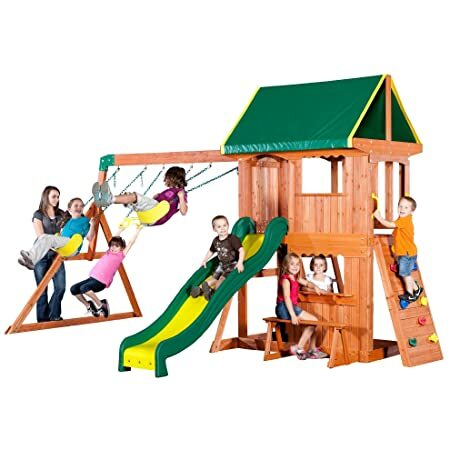 This wooden complete backyard play set comes complete with a slide, swings, climbing wall, and trapeze set to provide children with hours of climbing, sliding, and swinging fun. Each swing can support up to 250 pounds. It comes complete with all installation hardware and all wood pieces are pre-cut and pre-drilled for easy installation. This wooden play set comes complete with two swings, a slide, picnic table, rock climbing wall, and trapeze bar to help encourage your little one’s imaginative outdoor play. The premium cedar wood has been pre-cut and pre-drilled for easy installation and all installation hardware (including ground anchors) is included. This outdoor swing set comes complete with two swings (that support up to 115 pounds each) and a trapeze bar along with all hardware and illustrated instructions. It boasts durable solid wood posts that come complete with a five year warranty. 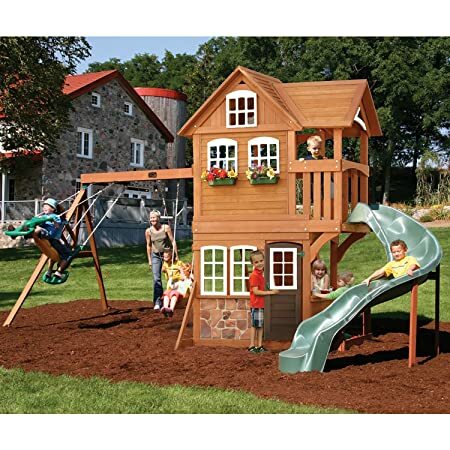 This wooden play set features a compact design that makes it ideal for setup in smaller yards. 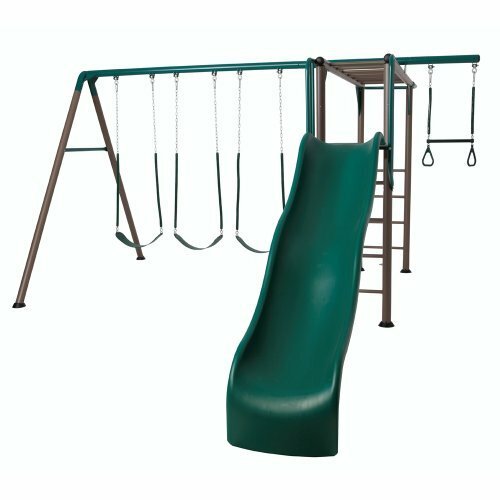 It comes complete with two swings, a slide, and a rock climbing wall for hours of outdoor play. The premium cedar wood pieces have been pre-cut and pre-drilled for easy installation. 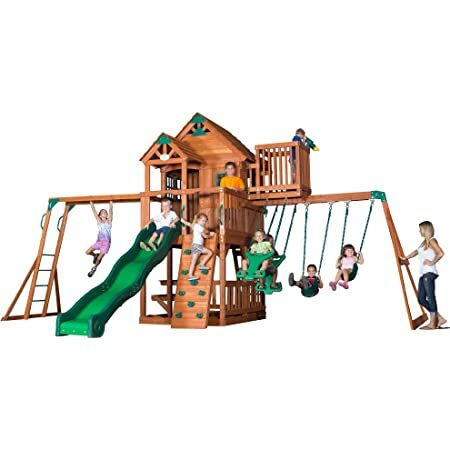 This wooden play set comes complete with two swings, a glider, slide, rock climbing wall and picnic table to keep your little ones busy all day long. It comes complete with all installation hardware and all wood pieces are pre-cut and pre-drilled for easy installation. This metal swing set comes complete with two height adjustable belt swings, a toe swing, seesaw, and slide. It boasts a durable powder coated steel frame that features six legs for added stability. It provides a fun outdoor play space for up to nine children at once and has been made in the USA for quality you can trust. This large outdoor swing set comes complete with two height adjustable swings, a four- and two-person glider, a trapeze bar, and a slide to provide a complete play solution for up to 10 children at a time. 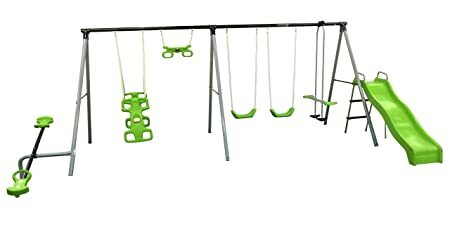 This metal swing set comes complete with two height adjustable belt swings, a toe swing, seesaw, and slide. It boasts a durable powder coated steel frame that features six legs for added stability. It provides fun outdoor play for up to six children at once. 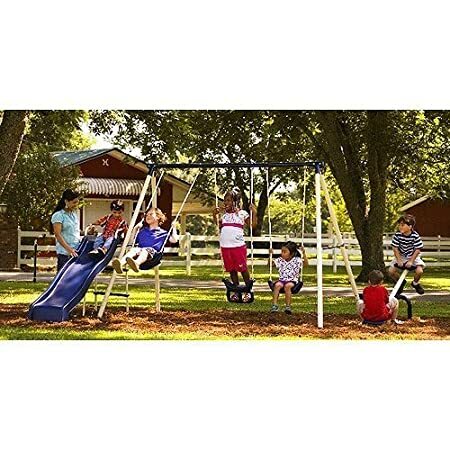 This swing set comes complete with two swings, two gliders, a trapeze bar, slide, and seesaw and boasts a durable powder coated metal frame for increased durability. It’s large enough for up to 10 children to play at a time and comes with a 180-day warranty. This simple backyard swing is the perfect first set for little ones and features a unique folding design that allows for compact and convenient storage when not in use. It boasts a lightweight and easy-to-assemble design. This outdoor play set comes complete with two swings, a trapeze bar, monkey bars, climbing wall, and slide for hours of outdoor playtime fun. It comes with everything you need to set it up right out of the box and features a crack-, splinter-, chip-, and rot-resistant design. 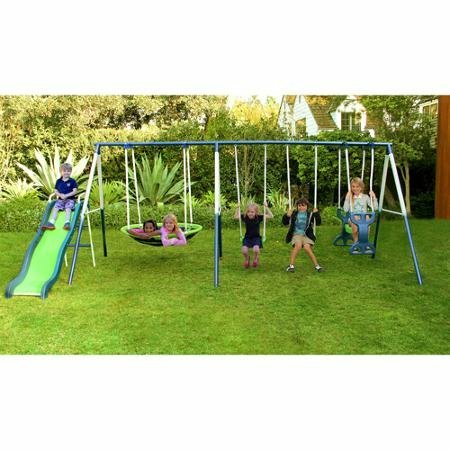 This metal swing set comes complete with two height adjustable swings, a glider, seesaw, slide, and trapeze bar to help keep your kids busy all day long. Up to eight children at once can play on this set. 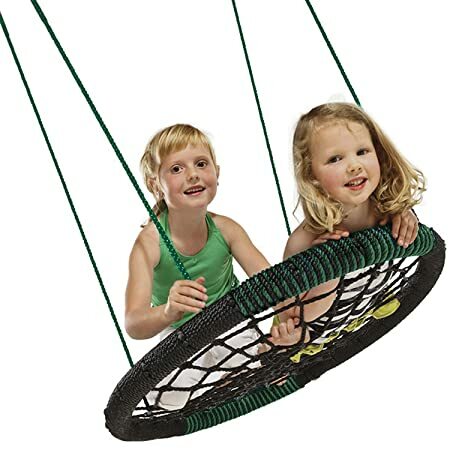 This psychedelic-looking swing set comes complete with two swings, a slide, glider, trampoline, and flying saucer to keep little minds engaged in play. It features a durable powder coated steel frame to provide years or reliable weather-resistant outdoor use. This psychedelic-looking swing set comes complete with two swings, a slide, glider, and flying saucer to keep little minds engaged in play. It features a powder coated steel frame to provide years or reliable weather-resistant outdoor use. 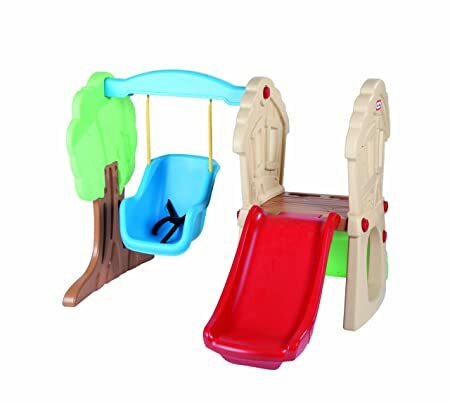 The perfect climb and swing set for the littlest of playmates, this set comes complete with a swing, small slide, and beginner’s climbing wall. It is suitable for use both indoors and outdoors and features a low height that’s ideal for those still mastering gross motor skills. This outdoor play set is a kid’s delight thanks to the two swings, gliders, rope ladder, slide, and basketball hoop. It boasts a durable and low-maintenance double-wall poly construction and was made in the USA for quality you can trust. Little ones will twist and slide to their heart’s content with this tube-style slide that easily mounts to any play set with a 7-foot platform. It’s recommended for use by children from 3-10 years old and is made in the USA with a lifetime warranty against cracks and breaks for quality you can trust. 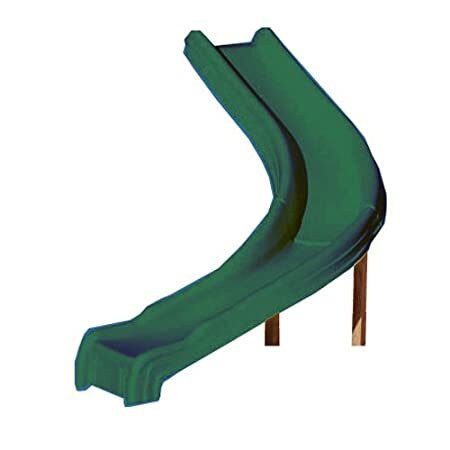 Little ones will enjoy the thrills of this twisty slide that easily mounts to any play set with a play deck that is 48-60 inches tall. It installs in about one hour and comes complete with all necessary hardware. 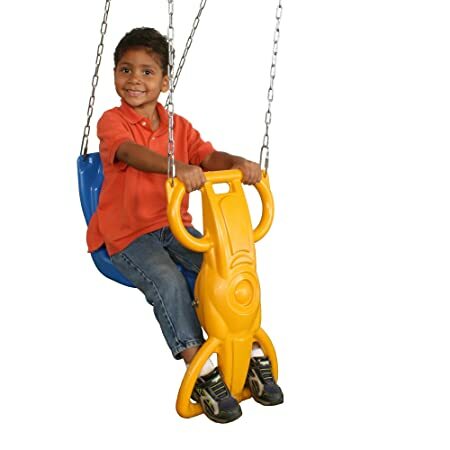 This larger glider comes complete with all mounting hardware and easy-to-follow instructions and can be used by one or two children at a time. It has been made in the USA for quality you can trust. 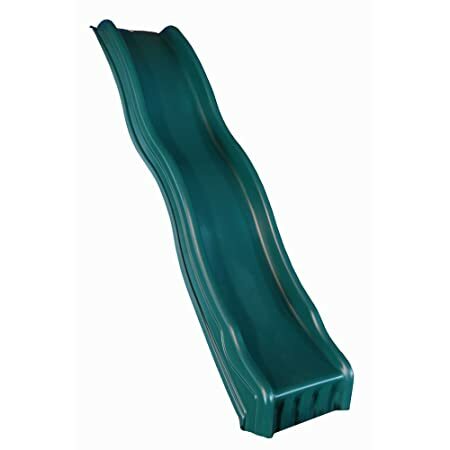 This fun and fabulous wavy slide boasts a durable, 1-piece single molded construction and is suitable for use with play decks that are 42-48 inches tall. It’s recommended for use by children from 2-10 years old and is made in the USA for quality you can trust. This uniquely constructed ladder boasts a two-piece flexible design that offers little explorers four ways to play and climb. All fasteners, hardware, and easy-to-follow instructions are included for quick setup. This cool add-on swing boasts a fun and unique design that allows for up to three children at a time with a combined weight of less than 250 pounds to swing. It features a durable polypropylene rope netting center that helps your child develop coordination and strength. This glider accessory is perfect for up to two children at a time and feel the wind in their faces. It comes complete with coated chains to help protect little fingers and boasts a weather-resistant plastic construction. 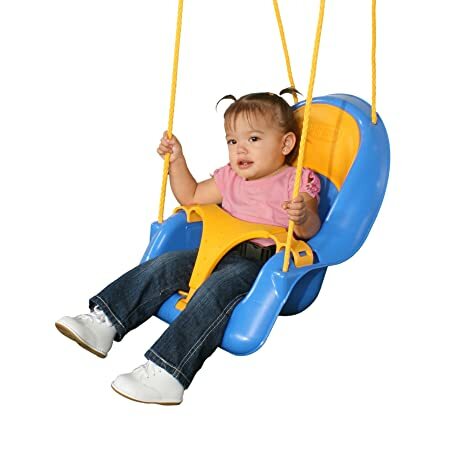 Suitable for use with the littlest swingers, this add-on toddler swing features a high seat back to provide kids with additional back support. The water-repellant seat padding can easily be removed for easy clean up and the included T-bar provides additional security along with a lap belt. 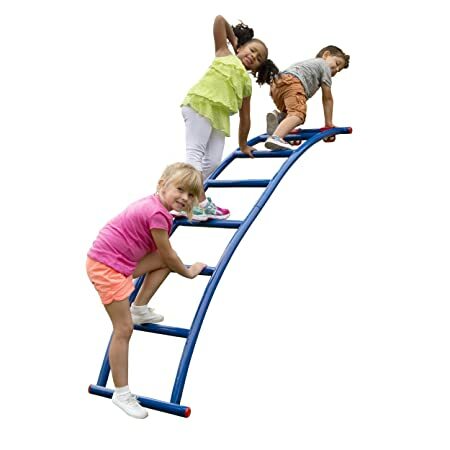 This fun and exciting rope-style ladder lets little ones climb to new heights while practicing their climbing muscles. 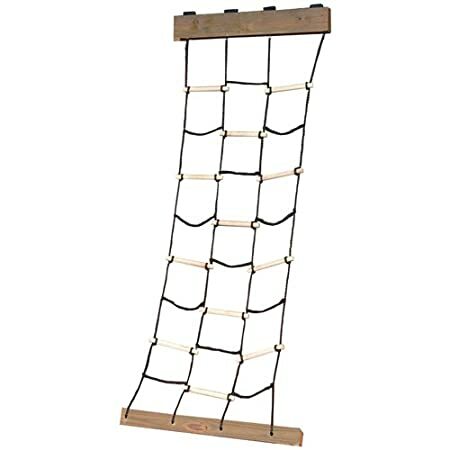 It features heavy duty wooden dowels and thick braided black rope to provide a secure and sturdy climbing surface. It can support up to 115 pounds and comes complete with a 5 year warranty. 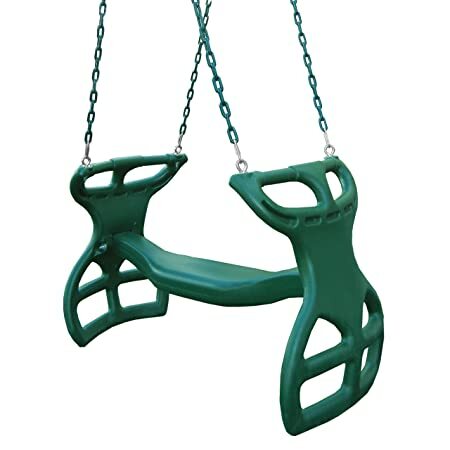 This uniquely-shaped swing lets little one’s soar to new heights and comes complete with all hardware to easily mount to a swing set or tree in just minutes. It comes fully assembled and has been made in the USA for quality you can trust. The perfect addition to any swing set, this glider boasts an ergonomic design to help keep your child safe and comfortable and comes complete with hand and foot holes to provide a more secure-feeling ride. It installs quickly and easily so your child can have more time to play. 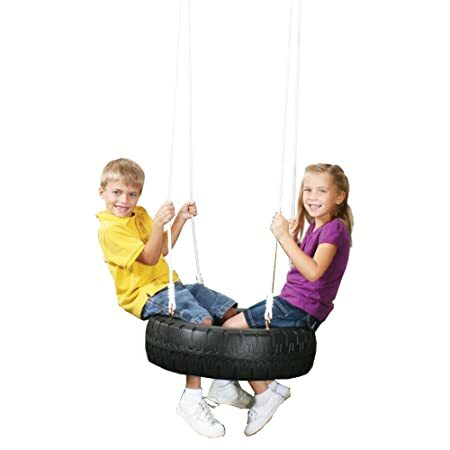 Let your kids live a little piece of your own childhood with this classic tire swing. It boasts a durable plastic construction that is weather-resistant and easy to clean. It is suitable for use by one or more children at a time and the rope hangers provide a secure spot to hold on. This fun and exciting rope-style net ladder lets little ones climb to new heights while flexing their climbing muscles. 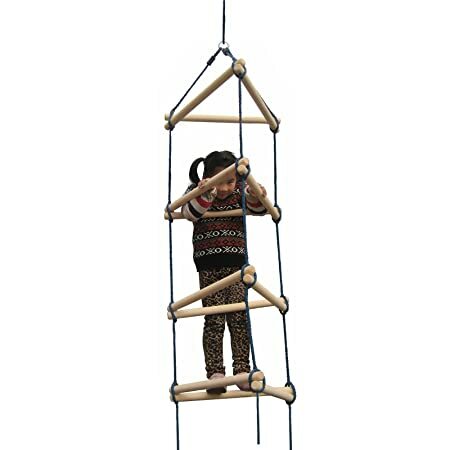 It features heavy duty wooden dowels and heavy duty nylon rope to provide a secure and sturdy climbing surface. It can support up to 150 pounds and comes complete with a 1 year warranty. This heavy duty swing set makes a great addition or replacement for your child’s swing set and comes complete with two adjustable steel chains that have been coated to help protect your little one’s fingers. 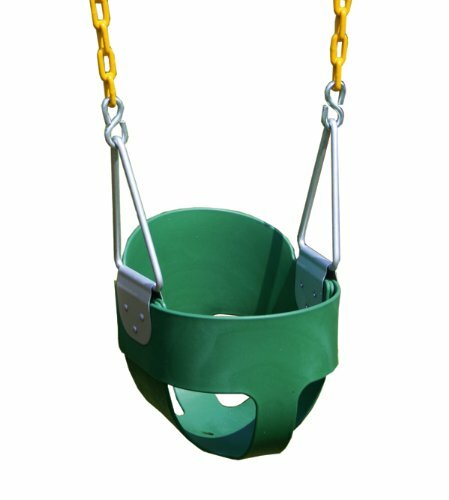 Ideal for use by babies and toddlers, this bucket-style swing comes in fun colors and features a highly durable copolymer plastic construction that is weather-resistant. The commercial grade, height adjustable chain has been coated with plastic to help protect little fingers. 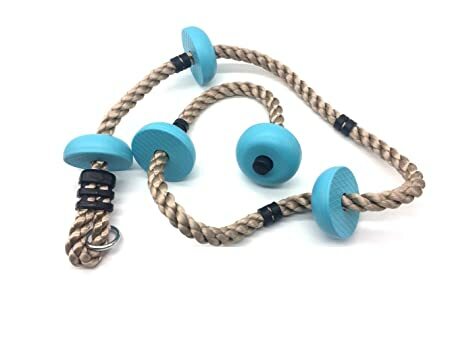 Kids will love seeing who can race to the top the fastest on this climbing rope add-on that can easily be mounted on an outdoor swing set, tree, or in a bedroom. It offers an excellent way for children to practice their coordination skills while developing strength and agility as well. 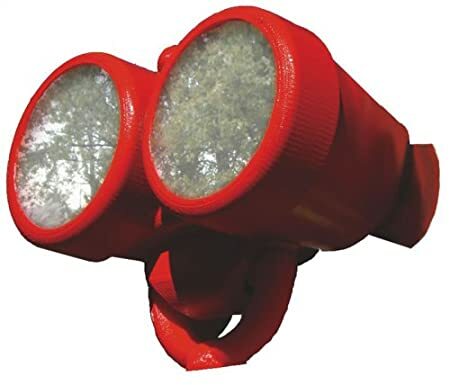 Your child can keep a watchful eye over their backyard kingdom thanks to these non-magnifying binoculars that easily mount on any play set. They boast durable and weather-resistant plastic construction and come with easy-to-follow instructions. 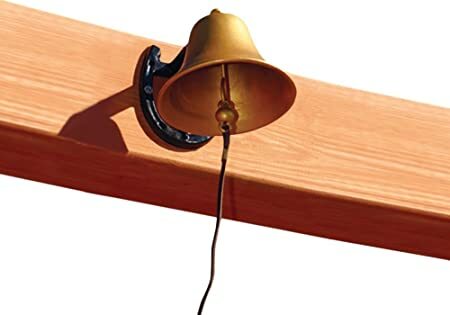 Your child can sound the alarm for play time with this cute, classic galvanized dinner bell. 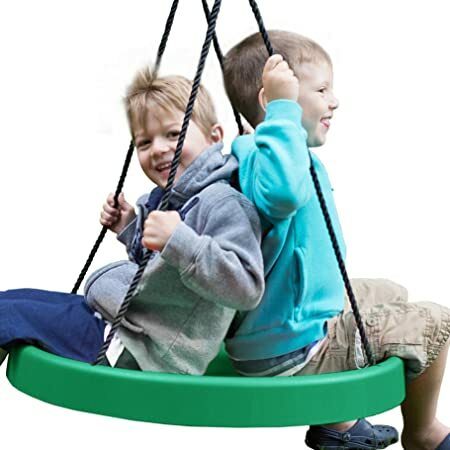 It comes complete with a weatherproof string and horseshoe-shaped mounting bracket that easily installs on any wood swing set. Your little one will love soaring to new heights on this kickboard-style swing that features foot-shaped grooves with anti-slip ridges to provide additional safety. Children can work on their balance and coordination all while building fully body strength. 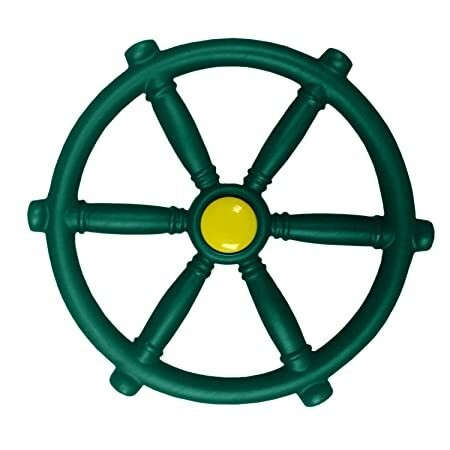 Get ready for your child’s imagination to set sail with this pirate’s ship wheel that easily attaches to any wooden play set.